I was putting together a playlist on Spotify this morning for 1983, to provide an ambience for the day. One album that caught my eye from that year was Into Glory Ride, the second album from Manowar. So I skipped over to YouTube and checked out the video for “Gloves Of Metal” and before long I was pounding my fist on the coffee table, chanting “Leather, Metal, Spikes and Chains”, and flicking a malocchio at the cat. So, come my “Manowarriors”, let us done our “Gloves Of Metal” and lay waste to “false metal”. Better call for the White Wizzard! 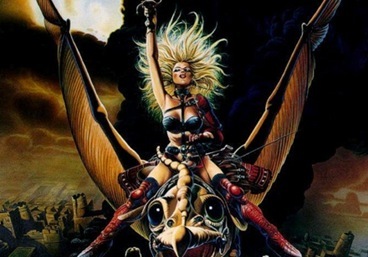 Although, seriously, I think this retro stuff is great as it reminds me why I got into metal way back in ‘79, basically an escape from the mundane. But, my fanatics, beware the ‘metal by numbers’.